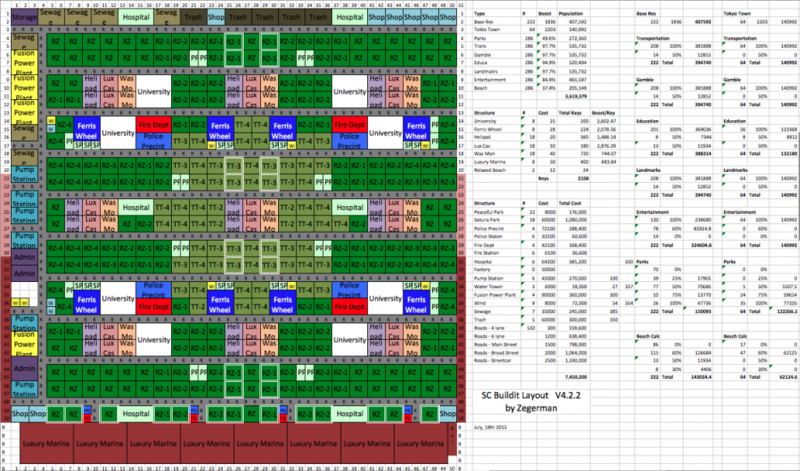 New Beach Update for SC Buildit: This is version 4.0.3 of my Sim City Build It layout guide for a maximum population. As is clearly observable, this guide is subject to constant changes and updates along with the updates of the game and small tweaks here and there that evolve over time. DO NOT take this population figure as the HIGHEST number possible. If you have a suggestion to improve (with NO HACKS) please let us know! This version of the guide uses only regular residential zones. A separate posting for a full Tokyo Town update will be created as well. LINK. Feel free to mix and match between the guides as most people will have a mix of regular and Tokyo Town residential zones. Today we have our SimCity BuildIt 3.4+ Million Population Layout Guide, with an overhead view and grid with buildings, services, and calculations and explanations as to why this guide looks the way it does. Earlier version of the guide can be found either on this website (see change log further down) or on the SCBuildIt subreddit. https://www.reddit.com/r/SCBuildIt/. A number of Mayors were part in the creation and tweaks of the layouts over time and they do deserve praise as well. This layout uses a combination of space saving Tier 1 and more efficient and pollution free Tier 3 utility service buildings (more in-depth info here). This guide uses a combination of Tier 1 and Tier 3 coverage services to provide fire, police and health to Sims (in-depth info here). Earlier Versions: Parks, Education and transportation could EACH provide coverage area to reach 100% population boosts to all residential areas. This means maximizing each of the three specialization and overlapping their coverage areas provides 300% total boost. Gambling, Entertainment, Landmarks COMBINED allowed a coverage area to reach 100% population boost. Unlike the specializations above, you could reach a MAX of 100% using any combination of the three. Gambling was used because it is the cheapest specialization to provide 100% coverage (20 keys). (in-depth info here). Recent Updates: The developers recently fixed this issue so now the game allows each specialization to provide a 100% population boost. This opened very different layout possibilities and made it possible to reach far higher population numbers. This means that you can have a total of 700% boost to any residential zone allowing population numbers above 3.6mil of the regular layout and even above 4.1mil for a full Tokyo Town city. NOTE: (many have asked about why we use Luxurious Casino versus Luxurious Casino Tower): The maximum amount of boost you can receive from a specialization is 100%. Overlapping two of the Luxurious Casino Tower (which give 60% boost each) would result in a 120% boost (20% wasted). So stick with the Luxurious Casino and you can save the golden keys. The layout requires enough keys as it is and saving some is always good. If you want to have more diversity in your buildings, you can mix them as well. The boost numbers will not change. Many have asked why there are no Places of Worship on the max layouts. The explanation for this is simple. They do not provide enough population boost to make them worthwhile. A church takes up 2×2 and provides 25% boost for a 12×12 space. The space it take up produces a residential zones loss of 1836 + approx. 600%, so roughly 13,000. The place of worship would have to cover approx. 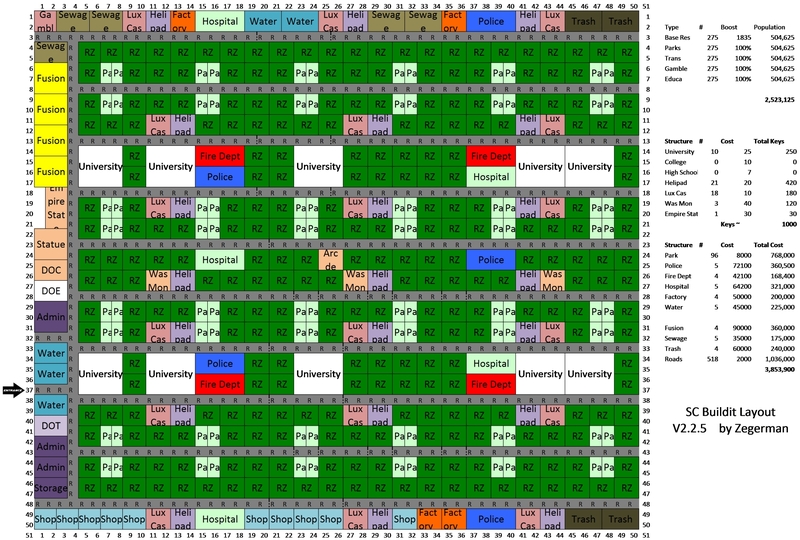 28 residential zones, which is not possible for the coverage ratio. One of the bigger changes in this layout from the last is the massive reduction of parks. Here again, we are looking at the same general issue as we are seeing with places of worship. For the past layouts I have been using mostly peaceful parks. They have a coverage ration of 7×10 in the game. As you can see in the screenshot below one peaceful park can only cover 19 residential zones max. 2 Peaceful Parks together can cover the below area, providing 19x2x459 = 17,442 population boost. But you need perfect coverage for that, which this layout does not allow. 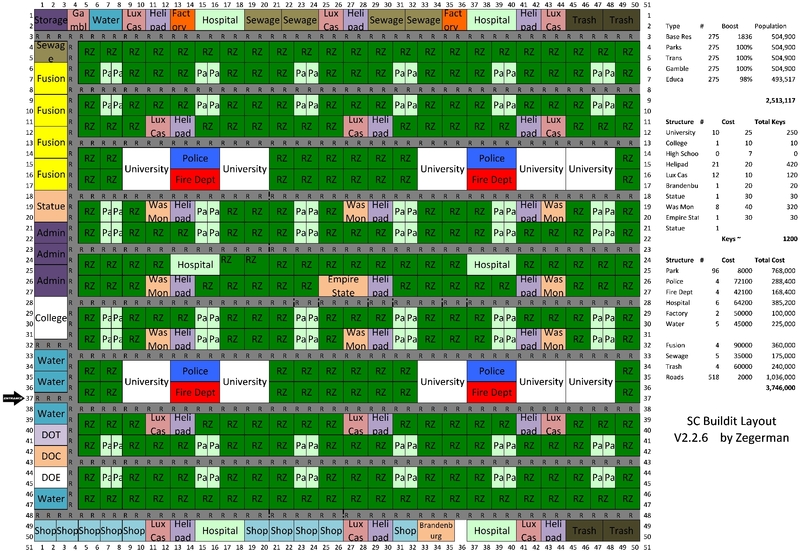 Please see below for a table that shows how many res units have to be covered by the both parks together. For this each park needs to be accounted for separately. 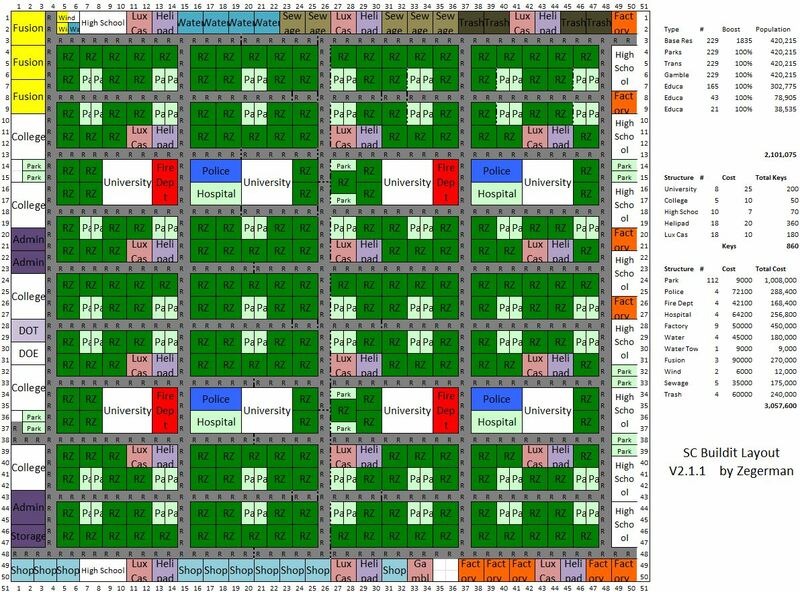 For the layout I picked the spots for parks that actually outperform their loss. 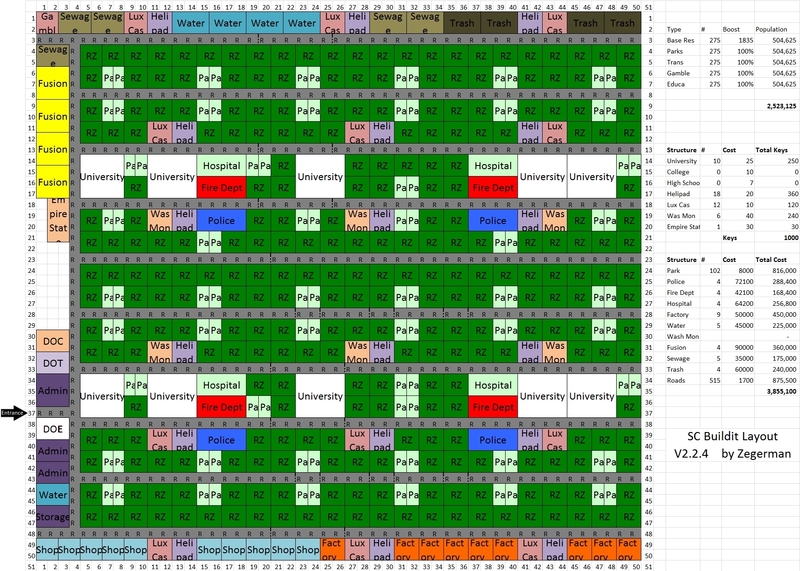 I have marked park coverage on the layout further down with RZ and RZ-1 – 4 corresponding to how many 25% park boosts the residential zone gets. Under current circumstances it is very difficult to get 100% education boost into the layout. For the people that like tweaking my layouts even further I have provided a more transparent calculation base for the education specialization. All residential zones that receive 50% boost are highlighted in a double white line around the zone. All other residential zones have 100% boost. With the beach layout additional population boosts are now possible. Upon looking at the different options it proved that Luxury Marina’s provided the best coverage and overall population boost. I have highlighted the rows on the side of the layout to which height the Luxury Marina boosts are effective. Update: To everyone that thinks that Sailormens Piers are more effective. I have checked this with the current layout and I concluded that Luxury Marinas provide about 1-2k more population and are way cheaper in terms of keys (about 370 keys less). If you want a more in depth proof of this, please let me know and I will gladly go through the calculations with you. This is an expensive layout in terms of simoleon cost. Especially the expenses for the road upgrades are extremely costly. Upgrading to Streetcar level is not always necessary. Also, simoleons simply accumulate over time with taxes. Don’t worry too much if you need to wait a few days for certain road upgrades or new utilities buildings, the keys are much harder to farm. For this current layout guide I went a step further and checked what is the most efficient use of our hard earned keys. Where do I get the most bang for my buck so to say. Please see below table based on the current layout in this guide. As you can see the Luxury Casinos clearly top the chart followed by University and Ferris Wheels. Landmarks and the beach section might look nice, but are by far the worst way to spend keys with the aim for max population. Since the relaxed beaches have such little effect on the total beach calculation I have simply added them together. I will leave it to each of you Mayors to pick and choose the best individual way to spend the keys. Birds eye view is below (click for an enlarged view). Please look at the abbreviation table for questions regarding any shorthand notations. UPDATE: I made a lot of changes to this version, so I will probably make a new post about this update. But since I am short on time at the moment, here is the current new layout with mixed TT and Regular zones, as most people will probably have something in this direction later on in the game. 2.1.4 Initial Release. No changes. SimCity BuildIt Layout Guide - 3 Million Population!